Home | LITFL | Clinical Cases | Managing the Critical Bleeder!! It’s 3am Monday morning when a 23 male is brought in with multiple small calibre gun shot wounds to his back and chest. What are your initial priorities in managing this case? Is it time to start the massive transfusion protocol? Q1. What are the definitions used to define “Critical Bleeding” and “Massive Transfusion”? major haemorrhage that is life threatening and likely to result in the need for massive transfusion. In children, as a transfusion of more than 40mL blood/kg (blood volume of children older than neonates is approximately 80mL/kg). Massive transfusion involves the administration of packed red blood cells, platelets and fresh frozen plasma on a 2.1.1 unit basis. Q2. What are the 5 common causes of critical bleeding? Q3. What should be evaluated for in the initial assessment of the critically bleeding patient? Changes in physiological criteria can be important determinants in identifying critical bleeding, however avoid relying just on systolic blood pressure as a sole determinant of haemorraghic shock as this may result in a delayed recognition due to patients physiological compensating measures. Q4. What classification tool can assist you in classifying haemorrhagic shock in the critically bleeding adult patient? 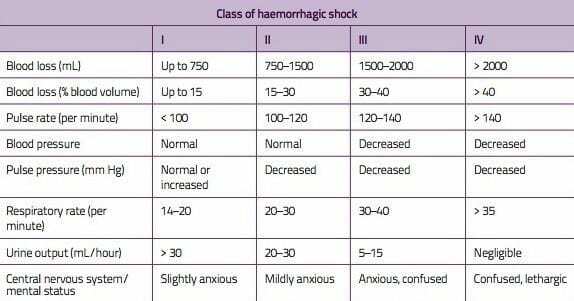 The American College of Surgeons have created a tool to help you classify stages of haemorrhagic shock. Q5. 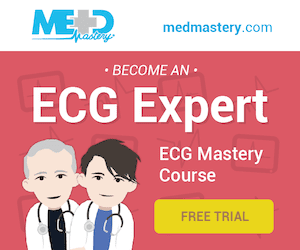 What is permissive hypotension and minimal volume resuscitation? Following research showing these complications the concept of permissive hypotension and minimal volume resuscitation was developed and dates back to being used during World War II in the resuscitation of victims of combat. Permission hypotension is generally employed in the management of ruptured abdominal aneurysms, however is contraindicated in the management of traumatic brain injury as it will reduced cerebral perfusion pressure and oxygenation further leading to secondary brain injury. Q6. What is the concept behind damage control surgery? 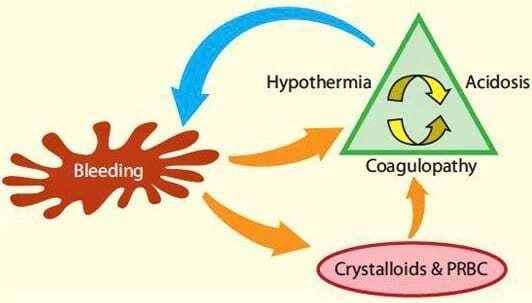 This approach emphasises control of bleeding and prevention of further contamination, to allow correction of hypothermia, coagulopathy and acidosis before definitive surgery is undertaken. Q7. Which biochemical values require monitoring in the critically bleeding patient? Values trending towards normal will indicate successful management of the critically bleeding patient. Q8. 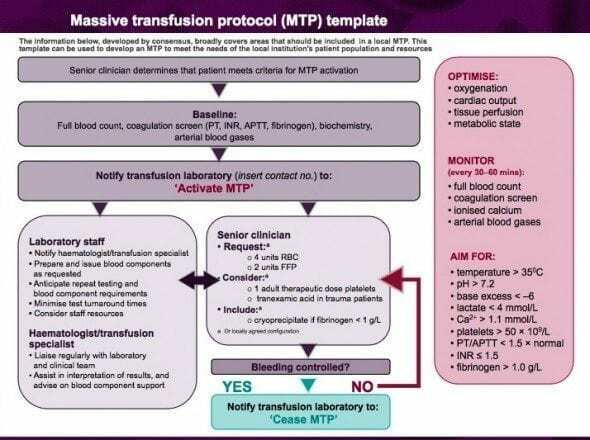 When should activation of the massive transfusion pack occur? Q9. What effect does dose, timing and ratio of component therapy have on patient outcomes? Although the jury is still out on what is the optimum timing ratio for PRBC, FFP and Platelets, most studies have shown significant improved survival rates in patients receiving 2, 1,1, some studies and author’s recommend doing 1,1,1 in patients requiring massive transfusion. 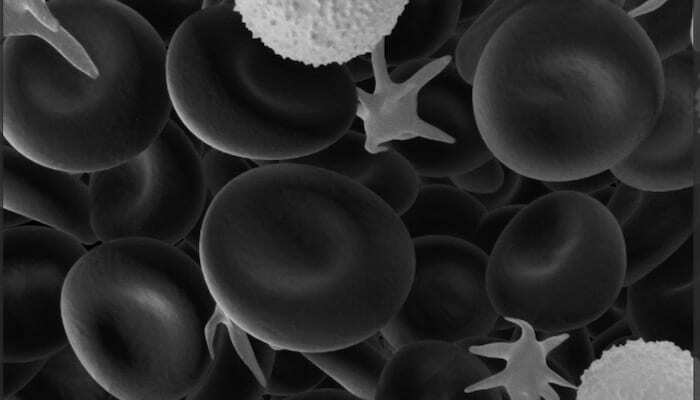 Further studies are needed before a recommended target ratio for PRBC, FFP, and platelets can be given. Blood component replacement should be guided by clinical assessment and results of coagulation tests. Optimum management requires prompt action, as wells good communication and coordination between treating clinicians, diagnostic laboratories and the transfusion service providers. Q10. 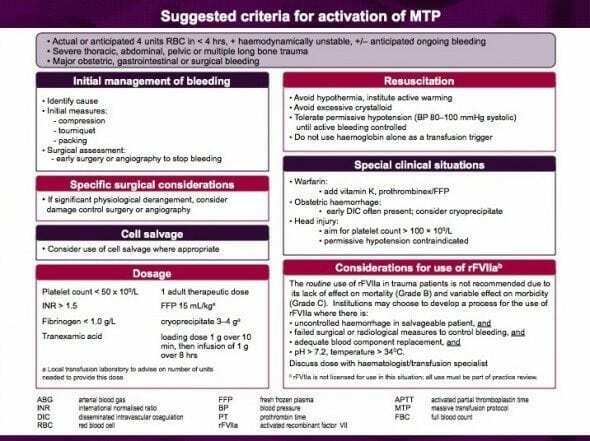 What are the recommendations for using Tranexamic Acid in the critically bleeding patient? Although the guideline reviewers did not specifically address the effect of antifibrinolytic therapy in critically bleeding patients requiring massive transfusion. The reviewers felt it necessary to included the data from the recently published CRASH2 Trial , that showed improved survival in trauma patients that received tranexamic acid. It is an antifibrinolytic that competitively inhibits the activation of plasminogen to plasmin, a molecule responsible for the degradation of fibrin. When should I give Tranexamic Acid? Tranexamic acid should be considered in patients with,or at risk of, significant haemorrhage. What dose of Tranexamic Acid should i use? Resus.ME — How about pre-hospital tranexamic acid?